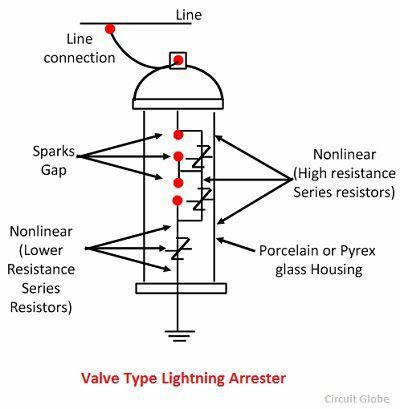 It is one of the simplest forms of the arrester. In such type of arrester, there is an air gap between the ends of two rods. The one end of the arrester is connected to the line and the second end of the rod is connected to the ground. 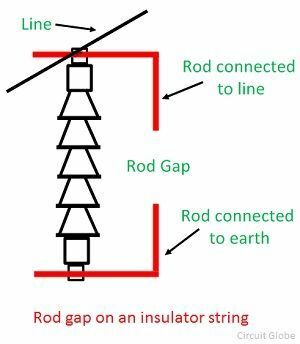 The gap setting of the arrester should be such that it should break before the damage. When the high voltage occurs on the line, the gap sparks and the fault current passes to the earth. Hence the equipment is protected from damage. In such type of devices, the air gap is provided between two different spheres. One of the spheres is connected to the line, and the other sphere is connected to the ground. The spacing between the two spheres is very small. A choking coil is inserted between the phase winding of the transformer and spheres is connected to the line. 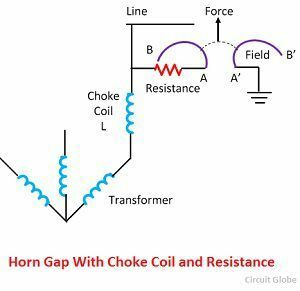 It consists of two horns shaded piece of metal separated by a small air gap and connected in shunt between each conductor and earth. The distance between the two electrodes is such that the normal voltage between the line and earth is insufficient to jump the gap. But the abnormally high voltage will break the gap and so find a path to earth. The multiple gap arrester consists of a series of small metal cylinder insulated from one another and separated by an air gap. The first and the last of the series is connected to ground. The number of gaps required depends on the line voltage. 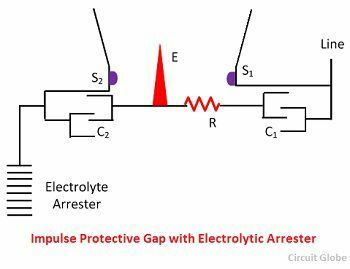 The protective impulse gap is designed to have a low voltage impulse ratio, even less than one and to extinguish the arc. Their working principle is very simple as shown in the figure below. It consists of two sphere electrode S1 and S2 which are connected respectively to the line and the arrester. In such type of arrester have high a large discharge capacity. It operates on the fact that the thin film of aluminium hydroxide deposits on the aluminium plates immersed in the electrolyte. The plate acts as a high resistance to a low value but a low resistance to a voltage above a critical value. 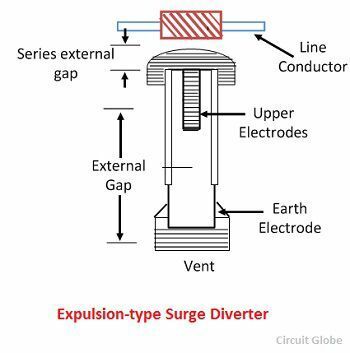 Expulsion type arrester is an improvement over the rod gap in that it seals the flow of power frequency follows the current. This arrester consists of a tube made up of fibre which is very effective, isolating spark gap and an interrupting spark gap inside the fibre tube. Such type of resistor is called nonlinear diverter. It essentially consists of a divided spark gap in series with a resistance element having the nonlinear characteristic. Such type of arrester is most commonly used for the protection against dangerous high voltage. It consists of the three which is an inorganic compound of ceramic material. The resistance of such material decreases rapidly from high value to low value and for current from a low value to high value. Such type of arrester consists of some flat discs of a porous material stacked one above the other and separated by the thin mica rings. The disc material is not homogenous and conducting material also have been added. Therefore the glow discharge occurs in the capillaries of the material and voltage drop to about 350 volts per unit. The discs are arranged in such a way that normal voltage may not cause a discharge to occur. It consists of pellets of lead peroxide with a thin, porous coating of litharge arranged in a column and enclosed in a tube of diameter. Out of the two lead, the upper is connected to the line, while the lower is connected to the earth. The tube contains a series spark gap. Such Types of diverter are also known as gapless surge diverters or Zinc oxide diverter. 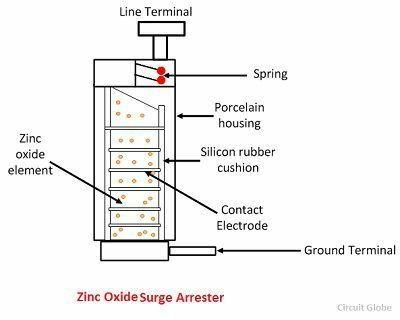 The base material used for the manufacturing metal oxide resistor is zinc oxide. It is a semiconducting N-type material. The material is doped by adding some fine power of insulating oxides. The powder is treated with some processes and then it is compressed into a disc-shaped. The disc is then enclosed in a porcelain housing filled with nitrogen gas or SF6.